Titans 4-163 (Jacques Rudolph 83*, Henry Davids 54, Nathan Rimmington 2-20) beat Perth Scorchers 7-124 (Mitchell Marsh 52*, Simon Katich 23, Cornelius de Villiers 3-16) by 39 runs. Titans trounced 163 runs after losing just four wickets in their allotted quota of 20 overs and Perth Scorchers were restricted to 124 with three wickets still available. Cornelius de Villiers (Titans) was declared ‘Player of the match’ for his destructive bowling spell of 4-0-16-3. 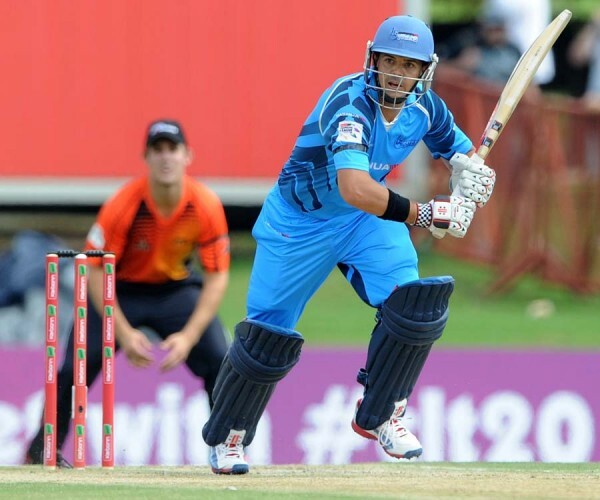 The first match of the Group A in the Chamipons League Twenty20 was played at SuperSport Park, Centurion, on Saturday, October 13, 2012. The toss was won by the captain of Perth Scorchers, Marcus North, who decided to field first. The Titans initiated the innings with Jacques Rudolph and Henry Davids in an aggressive style. Rudolph got a flying start by scoring 11 runs in the first over with 1 six and 1 four as Davids got the same result twice in the later overs. The fifty of the innings was attained in six overs as Davids hit a couple of sixes and one four in the eighth over. Rudolph continued his onslaught from the other end and most of the scoring was assisted by the boundaries. Both batsmen smashed their half centuries in the 12th over and the hundred of the innings was also accomplished. The eventful opening partnership concluded at 109 in 12.2 overs when Henry Davids was clean bowled by Michael Beer for 54 off 38 balls with 4 towering sixes and even fours. Jacques Rudolph continued with his militant knock until the last ball of the 20th over as the Titans reached 163 with six wickets still available. Rudolph remained unbeaten for 83 off 59 with 3 lofty sixes and 9 well placed fours. Nathan Rimmington left some kind of impression while bowling by taking two wickets whereas Michael Beer and Joe Mennie claimed one wicket each. Herschelle Gibbs and Shaun Marsh started off slowly for Perth Scorchers and gathered 15 runs in the first three overs. Cornelius de Villiers struck twice in the next over by removing Shaun Marsh and the newcomer Marcus North. Gibbs multiplied the worries of his team when he was caught by the wicketkeeper Heino Kuhn off Alfonso Thomas for 19 and they were 3-40 in 7.4 overs. Simon Katich and Mitchell Marsh joined together in a critical situation and enhanced the score to 60 as the first was gone for 23. That was the start of the disaster for the Perth Scorchers as the rival bowlers took over the match. Marsh was the only batsman who provided some resistance as the wickets kept on sliding from the other side. Mitchell Marsh punished Eden Links for 18 runs in the 16th over with 1 six and 3 fours and completed his half century on the third ball of the 20th over. Marsh held his end for 52 off 41 deliveries with 1 six and 5 fours as Perth Scorchers managed 124 runs for the loss of seven wicket in 20 overs. Cornelius de Villiers was the best bowler who clinched three important wickets whereas Eden Links, Alfonso Thomas, RE van der Merwe and David Wiese shared one wicket each. The Titans won the match comprehensively with a great margin of 39 runs and earned four valuable points.